Gold Rush Expeditions, Inc. is proud to present the US Mine Property and Mineral Claim. 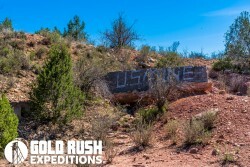 The US Mine is a 20 acre lode Mining claim for sale exclusively through Gold Rush Expeditions, Inc. The US Mine is located outside of Jerome, Arizona and has been properly staked and marked at all corners. All Gold Rush Expeditions, Inc. claims are meticulously surveyed, mapped and researched. On-site field work is completed by Corey Shuman and Jessica Shuman, nationally recognized Mineral Surveyors with over 36 years of combined experience. You can drive directly into the mine workings. The claim is located off of a high clearance 2WD road. Contact us for exact coordinates. This claim should be considered for a small to medium sized mining operation. The ores are rich and in good supply, but will need to be processed in bulk to be profitable. This will require a Notice of Operation, which Gold Rush can assist with. This mine has an extensive history of production. The mine has been worked on and off It was worked as an open pit so there are no underground workings. The entire area is littered with copper ore. Historically the US mine was worked for Gold, Copper and Silver. Massive amount of work was done at the site. There is a railroad and stream near the claim. The claim is not too far from the old Bear Railroad station. This was likely where the ore from the US Mine was taken and shipped out via train. The roads to the claim are in excellent condition. It is a long drive into the claim, nearly 35 miles on dirt roads out of Jerome. The roads are well maintained. A high clearance 2WD will have no issues in dry conditions. The ore bodies are pyritic replacement deposits in schist, generally in rhyolite porphyry schist. Some of them are elongated along the schistosity, but the largest deposits are vertical or steep chimneys, with irregularly rounded outline. The ore minerals are pyrite and chalcopyrite, the gangue quartz, and earthy carbonates. There are also irregular quartz veins with coarse pyrite and chalcopyrite and the same gangue minerals, but these have contributed little or nothing to the production. Through descending waters, enriched zones have been formed below the pre-Cambrian peneplain, and large bodies of chalcocite of this origin have been mined, particularly in the United Verde Extension. The deepest ore body is that of the United Verde mine, which has been followed to a depth of 2,500 feet. There is also a third type represented by the Shea, Yaeger, and Shylock mines, the last two in an adjoining district. These deposits form well-defined fissure veins striking east and dipping south; they are really lenses of quartz which present a different type and may be of somewhat later age than the pyritic deposits. They carry in a quartz-ankerite-siderite gangue such minerals as tetrahedrite, bornite, arsenopyrite, galena, and sphalerite but have contributed comparatively little to the production. The freight rate is $1.00 per ton for ore up to $15.00 per ton and a raise of $.25 for each $10 raise in the value of the ore. Smelter rate $2.75 to $3.75 per ton. The ore seen is on the end and sides of the shaft. 20 feet down the shaft a 4 inch cut was made across both ends and both sides which assayed 3.32 % copper. 26 feet down shaft a sample taken around the shaft as above which assayed 1.47% copper. 32 feet down the shaft a cut was made around the sides and ends which assayed 4.79% copper. Across the bottom both ways, sample assayed 5.65% copper. The owner shipped 25 tons to Clarkdale Smelter which assayed Copper 2.81% SiO2 77.8%, zn .1% .3% S., CaO 1.3% Fe 1.0% Ag .21 oz. Au Trace. The present work consists of a 5 x 7 vertical shaft 54 feet deep, and this is well timbered to within 10 feet of the bottom. The owner did have another shaft on the property, and from which were some drifts. This shaft and drifts were caved in during a heavy rain storm, so he decided on the new site. Large amount of copper and lead type ores noted around the claim site. Some quartz bodies and some chert type materials were found with iron. No gold was noted in the general vicinity. If it does exist in the area, it is microscopic and will require fine processing to extract.